Serbia’s nationalist President Tomislav Nikolic recently gave his personal apology for the first time for the 1995 Srebrenica massacre of 8,000 Muslims, but stopped short of calling it genocide. “I kneel and ask for forgiveness for Serbia for the crime committed in Srebrenica,” Nikolic said of the slaughter, the worst atrocity in Europe since World War II. “I apologize for the crimes committed by any individual in the name of our state and our people,” he said in an interview to be aired on Bosnian national television, parts of which have been released on You Tube. After being elected last May, Nikolic refused to acknowledge that the massacre in the Bosnian enclave — in which some 8,000 Muslim men and boys were killed by Bosnian Serb forces — was a genocide, despite it being ruled as such by two international courts. “We do not need someone to kneel and ask for forgiveness. We want to hear the Serbian president and Serbia say the word genocide,” Munira Subasic, president of the Mothers of Srebrenica association told AFP. “Only then we will believe that it is a sincere gesture,” she said. “We need Serbia to accept rulings by the international courts,” said Subasic, whose husband and son were killed in Srebrenica massacre. Nikolic’s apology came a few days after a member of Bosnia’s tripartite presidency Bakir Izetbegovic had indirectly urged him to acknowledge Srebrenica massacre as genocide. We need to stop for a moment and look back to … what has happened in Srebrenica. We ask this truth to be recognized and words to be chosen when talking about it … and to respect the decisions of the international courts,” Izetbegovic said after meeting Nikolic in Belgrade earlier this week. While this marks Nikolic’s first apology on Srebrenica, Serbia has in the past expressed regret over the deaths. In 2010 the Serbian parliament passed an historic declaration condemning the Srebrenica massacre in a gesture ending years of denial by Serbian politicians about the scale of the killings, but Nikolic at the time did not support the move. Nikolic’s predecessor Boris Tadic also apologized to Srebrenica victims during a commemoration event in 2005. Both the ICTY and the United Nations’ highest court, the International Court of Justice, have found that the Srebrenica massacre was a genocide. Bosnian Serb wartime political and military leaders Radovan Karadzic and Ratko Mladic are currently on trial on genocide charges before the ICTY for their role in Srebrenica massacre. 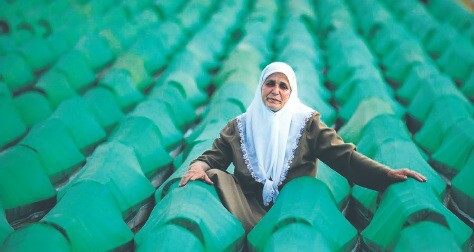 A mother remembers the Srebrenica massacre while visiting victims of Serb atrocities.